Yokohama's Noge (野毛町・Noge-cho) area has a history as a drinking district stretching back at least to the post-war U.S. occupation of the Port of Yokohama. While most of the country was suffering from scarcity, the Noge area, located on the outskirts of the U.S. base, became known as a place where you could get anything you needed, from food and drink to black market goods. While the base is long gone and the port area was redeveloped into the glitzy Minato Mirai in the 1980s, Noge has remained relatively untouched by the passage of time. 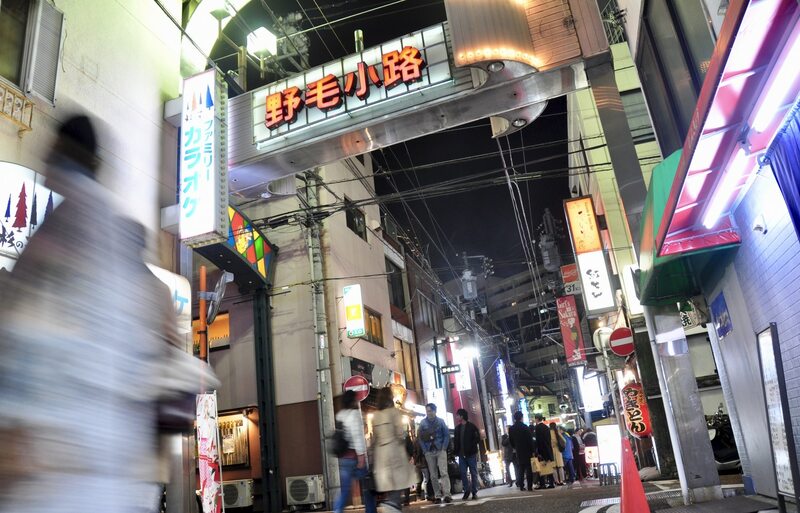 Each street offers a slightly different retro vibe, a funky mish-mash of '60s-style shops and '80s-style neon comprising some 500 small bars, Japanese-style pubs (izakaya), karaoke boxes and jazz clubs, the lattermost reflecting another influence of the U.S. occupation. Located just south of Sakuragicho Station, the area was hit hard when the Tokyu Toyoko Line, which connects Tokyo to Yokohama, closed its southern extension connecting Yokohama to Sakuragicho in 2004. Noge responded with a major price-slashing campaign, and has been revived as a hub for cheap drinks. Now popular among students and salarymen, more and more shops are being refurbished for a younger clientele, and you'll find the hottest spots announced by long lines on weekends. Beyond drinks, Noge is also known for its late April street performance festival, Noge Daidogei (野毛大道芸), which has been held annually since 1986. Meanwhile, Noge Jazz de Bon Odori (野毛ジャズde盆踊り) is held in late September to celebrate the traditional Bon festival with a slightly weird combination of samba, jazz, taiko drums and professional wrestling. The more straight-laced Yokohama Jazz Promenade is hosted here in October. Noge is a great spot for a cheap, casual drink in Yokohama. If you'd prefer something more upscale, walk 10 minutes north to Minato Mirai, a popular date spot. And if you'd like a bit more adventure in your drinking life, head a block further south to Miyakobashi Shotengai, effectively an annex of Noge, where you'll find a collection of tiny drinking establishments crammed between two bridges along the Ooka River.